South Africa is one of the countries that I have always wanted to know. Not only because it has incredible natural landscapes, but also for its gastronomy. And if we emphasize the latter, it is important to note that among the dishes most consumed in South Africa are salted cured meat Biltong, Boerewors sausage, Isidudu pumpkin pap, Hoenderpastei chicken pie and the exquisite Bobotie, on the one we will pay attention to do precisely to the commercial exchanges in the area made by this corporation, significant cultural contributions also emerged between the territories that made up its route. That is why in South Africa it happened that a dish of Indonesian cuisine became popular. 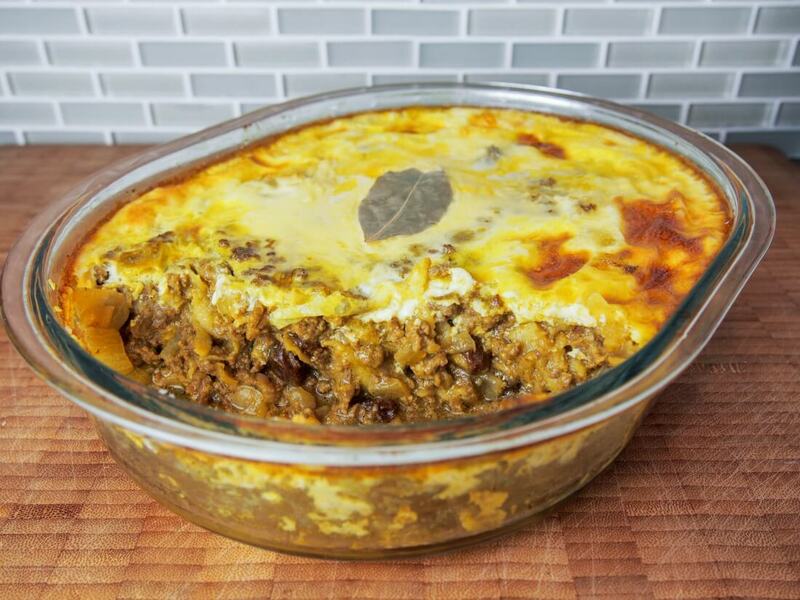 South African favorite - Bobotie! Basically, and in broad strokes, it is a spicy minced meat cake that has the peculiarity of having an egg layer on top, a kind of “tortilla " that curdles in the oven over meat. It is a dish with which to enjoy the slight contrast between sweet and salty. Do you want to know a little more about its origin? There is evidence of its existence since the seventeenth century in some places of the Cape of Good Hope, although there is also speculation that it could have come from the hands of the Dutch settlers who, in turn, were influenced by the Indonesian cuisine. One of the most common ways to accompany this cake is with rice. Simple rice, boiled and seasoned with lemon juice and curry. The recipe is known as Bobotie, a name that seems to come from the term Bobotok, the Indonesian denomination for Batavia, the current Jakarta. Although the recipe has evolved over time but today many people ingest it without knowing that it is an Asian recipe in its origin. It started with goat and pork, also incorporated ginger, sliced lemon, and marjoram. But do not worry, I offer you an updated version. The bobotie is a meatloaf typical of Cape Town. It is complemented with the egg cooked in the oven, raisins and as an accompaniment; it is usually decorated with nuts, banana, rice and a spicy sauce. The mixture of sweet and salty make this dish have a very characteristic flavor if you are one of the people who like to mix flavors ... do not think about it and try it! It is a dish of Malaysian cuisine and its particularity is that it resembles a meatloaf with raisins and is cooked with eggs on top. In the beginning, the Bobotie was recognized in certain sectors as the Cape of Good Hope and at the time, it was usually made with minced meat and lamb. Nowadays, the daily thing to make such a cake is to incorporate dried fruits like raisins or sultanas and give it that characteristic of sweet flavor. It takes just about 20 minutes to assemble before going into the oven, so it is not difficult or time-consuming. Today it is much more likely that it was made with beef or lamb, although the pork dish lends more moisture. The first recipes incorporated ginger, oregano and lemon peel, the introduction of curry powder has simplified the recipe a bit, but the basic concept remains the same. Some recipes also require chopped onions to be added to the mix. This recipe was brought to you by Saffatrading . Saffatrading is a South African food shop. In the first place, we will peel and chop the apple, discarding the central part of the heart. We will peel the carrots and chop them. We will put the carrots and the apple in the glass of the blender and we will crush it. On the other hand, we will peel and chop the onion. In a pan with a base of olive oil, we will poach the onion and the shredded carrot with apple. Meanwhile, we will put the slices of bread to soak in the milk. They will end up absorbing all the milk. After about five minutes and when we see that the onion is done, add the minced meat and sauté well until the meat is ready. We will pepper it- we will add the bread soaked in milk, curry (to taste), mustard, the juice of half a lemon and a beaten egg. We will mix everything well, crushing the bread so that it is integrated into the meat without being noticed and we will cook a couple of minutes more. We will introduce everything in a mold suitable for oven, smoothing the surface of the meat so that it is equalized and thus achieve a better appearance in the final result. We will beat the three remaining eggs, add a pinch of salt and curry, and pour them over the meat. On the surface of the cake, we will put some bay leaves. We will put it in the oven at about 200 ° C for about 30 minutes, or more in case the top of the egg is not well curdled. In fact, it is recommended that the "tortilla" that forms on the surface be a little golden. Once the Bobotie is ready, wait about 10 minutes for it to be tempered a little and it will be ready to eat. Have you already started preparing all the ingredients to receive the guests at home tonight?